Don't let the smiles fool you. These women have serious plans. 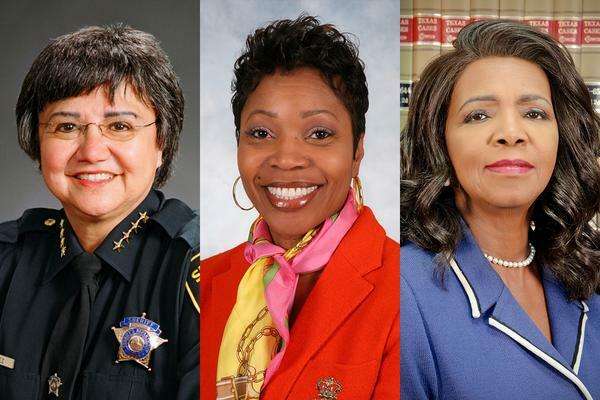 Join me, Dallas County Sheriff Lupe Valdez, Dallas’ new police chief Renee Hall, and Dallas County District Attorney Faith Johnson for an informal panel discussion about the future of law enforcement in Dallas. There’s plenty to talk about, from the impact of the pension crisis to the state of Dallas County detention centers. Have a beer or a glass of wine, bring friends and questions, and get to know your city leaders a little better. The next Happy Hour With an Agenda will be on Monday, October 16 from 6 to 8 PM at 750 N. St. Paul St., Ste. 2100. It’s free. You can visit D HQ. There’s a great view. If you don’t want to ask questions yourself, submit them in the comments below. Reserve your spot here.